Halloween will be here before we know it and I just can’t wait! 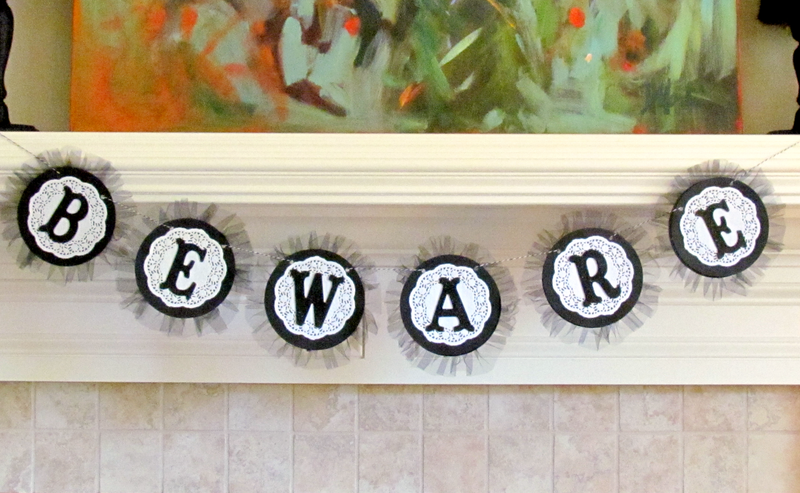 This year, I wanted something new to jazz up my holiday mantel, so I made a beautiful Beware Halloween banner. I love that it is bold with black and white and the birds holding it up with their beaks up add the perfect touch of whimsy! Step One. Paint the chipboard letters with the black acrylic paint. 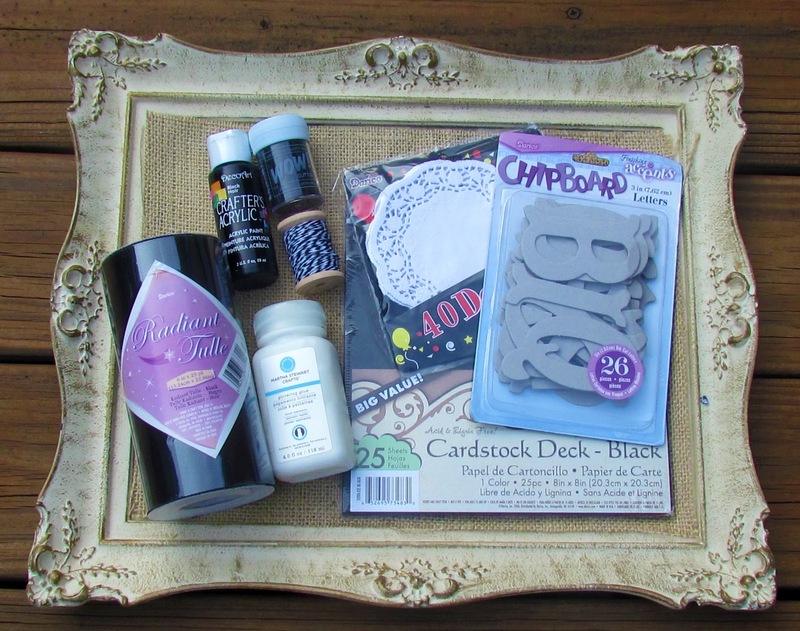 Once the paint dries, brush on a layer of the glitter glue and sprinkle the letter with the black glitter until the front and sides are completely covered. Let dry completely before moving on to step two. Step Two. Apply glue dots to the underside of the paper doily. You will then flip it over and center onto the black circle. Smooth to make sure it adheres well. 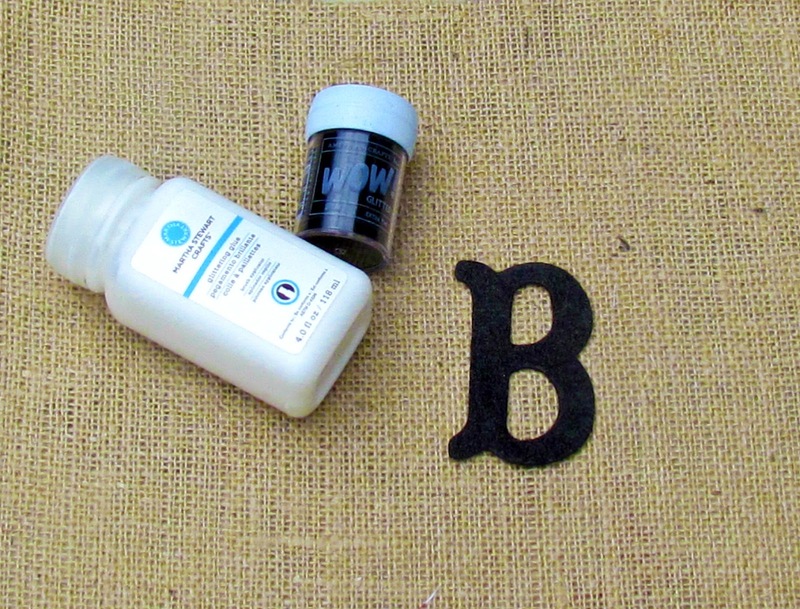 Now you will turn your letter over and apply the glue dots to the back. Flip it back over and center on top of the doily and glue into place. Step Three. Now comes the fun part… ruffles! I cut a few 12″ lengths of tulle and cut it in half and then in half again, so you then have four 12″ lengths of tulle. 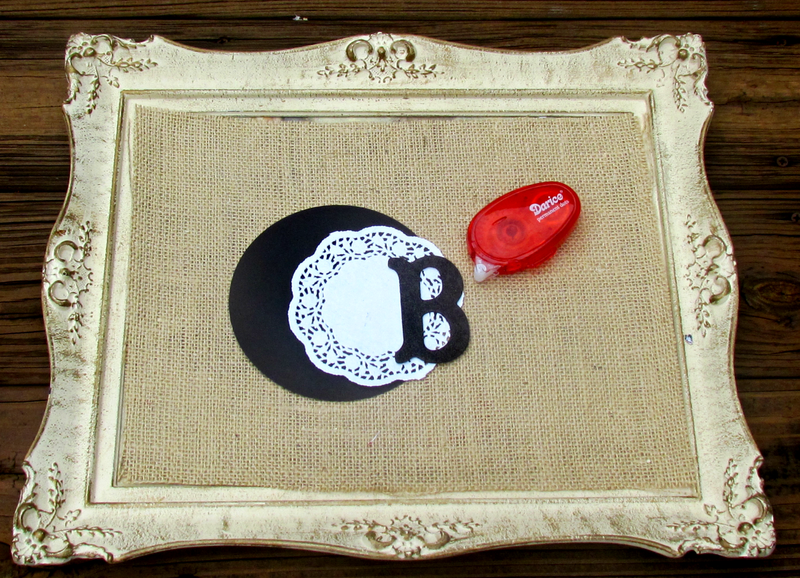 Apply a layer of glue dots to the outer edge of the circle. 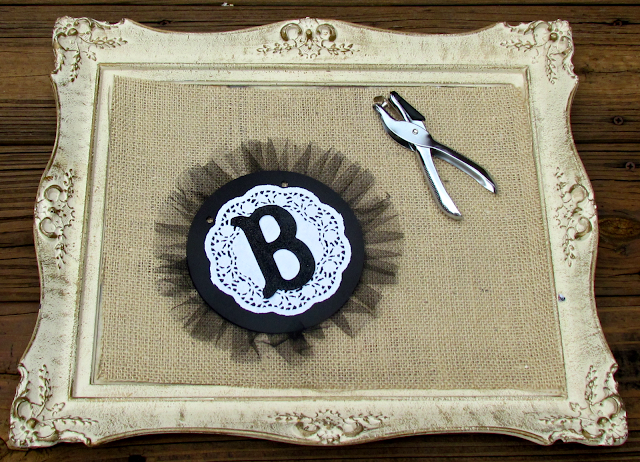 You will now squish the tulle together and push onto the glue dots. Continue until you have covered the complete outer edge of the circle. Step Four. Now you will apply a layer of hot glue on top of the circle with the tulle and lay the other black circle on the top. 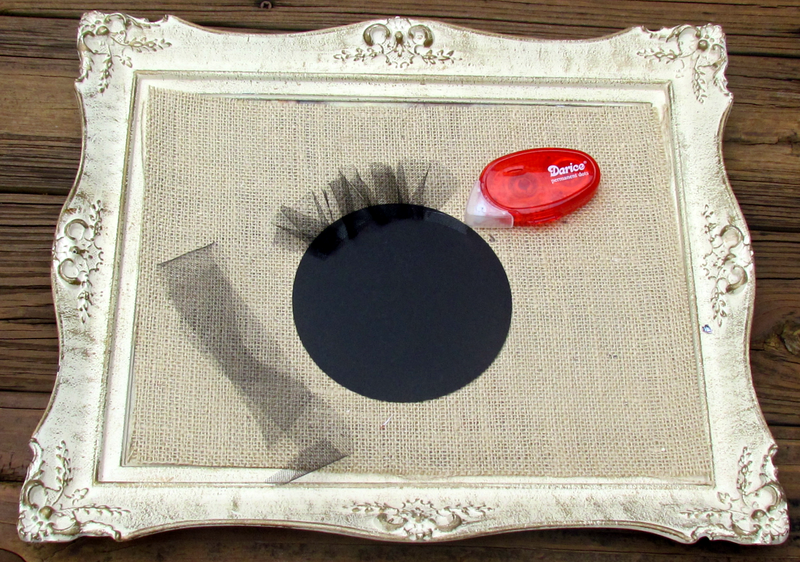 You should now have one piece with the tulle sandwiched between the circles. Repeat with the additional letters. Step Five. To finish you will punch two holes into the upper portion of the circles and thread the black and white bakers twine through all of the letters and hang it up! The last little bit of fun that I added was attaching the tails of the baker’s twine to the birds’ beaks. So fun! I just love how it turned out! The best part about this banner is that the design can be used for birthdays, baby showers, Christmas, really for any type of celebration. Enjoy! This is really cute, and really adaptable for other celebrations. Stopping in to pin your garland, I love it. I really love this banner idea! I want to make one of these for Christmas decor! These are darling!! Love it!! 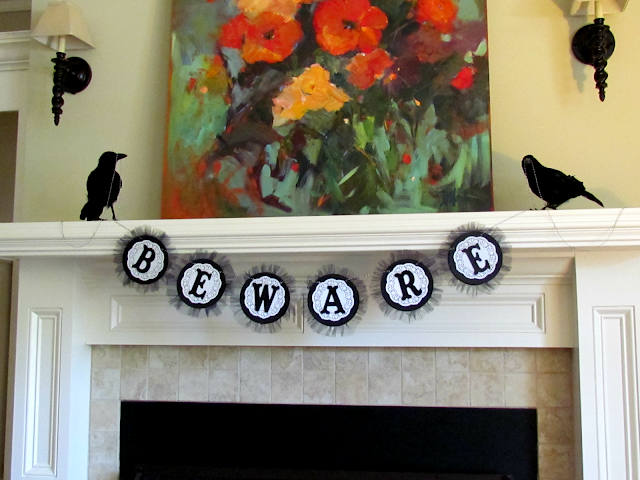 Love this simple Halloween banner! Love that tulle ruffle! Beautiful banner and it’s inspiring me for the Halloween season! Welllllll darn it! You officially have made me want to start decorating for Halloween! AND I just LOVE your look! Thank you SO much for the great inspiration! I love this, and the use of the birds is so clever!! This is too cute! But still a little scary, what a great banner! Love it! Wow! I just love this!! !